Love love love deviled eggs. I can't make them too often though, I'll eat them by the dozen! I love deviled eggs. Growing up in the south (USA) we make them a little different. Real mayo instead of miracle whip and relish or pickle juice. But always the paprika! I might try your version. 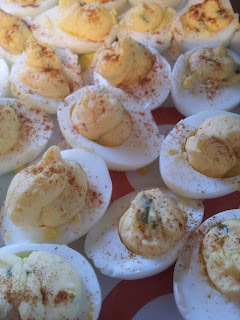 Love deviled eggs. Try mixing in some crumbled bacon and cheese, really good!